Jack Butala: Jack Butala, Jill DeWitt. Jack Butala: Welcome to our show. In this episode, Jill and I talk about how to buy an apartment building, and here’s a hint; it’s way easier than you think. Before we get into it, let’s take a question posted by one of our members on Thelandinvestors.com online community, it’s free. Jill DeWit: Okay. Tom asks; how do you close on a property if the daughter is the executor of the property? What kind of documents are needed to close this purchase? Jack Butala: Which it never is. Jill DeWit: Exactly. But I’m gonna took the easy one first, I’ll give you the hard, I’m gonna take the easy one, you get the hard one. Jill DeWit: So, I’m gonna say I’m gonna assume it was done right and it’s in a trust, and it’s the Smith Family Trust of 1983, whatever that is, and she’s the only one, and you’ve seen the trust, you’ve got an email copy of it from the daughter, cuz she’s that on the ball, and it’s that easy. That’s what you do. So, how do I close on the property? The exact same way I do on everything else, and the only thing different I do is on the deed, I’m gonna still put the, the grantee becomes the grantor, right? Cuz they’re selling it to me now, and I’m gonna use that verbatim, The Smith Family Trust of 1983, and then below I the signature you’re gonna put her name, and I even defer to them, I’m gonna go real easy on this one. I’ll reach out to her and say, all right, you’ve obviously the executor, you’ve been doing other things for this trust, how does your attorney have you sign your name? And she’ll say, oh it’s supposed to say Carol L. R. Smith as trustee for The Smith Family Trust of 1983. Great, fantastic, and I’ll copy that. I took the easy way out, now you want to add the, how it could be way out? Jack Butala: You know it was exactly this related to the question from yesterday. When people have a will and the property’s in the deceased owner’s, it’s still in their name, but they have a will, it’s not like a car, there’s some stuff involved. More importantly, in 1983 you were 16, Jill, right? Jill DeWit: I’m not sharing any information. Jack Butala: It just makes my heart all warm inside for some reason. Jack Butala: I wish I had known you in high school. Jill DeWit: Oh my gosh, you did not just say that, cuz I’m sure that number’s way off. Jack Butala: You’ll be having a birthday party, a two person birthday party, meaning you and I, in an explosive manner. Jill DeWit: I wasn’t gonna share that, what number it is though, it could be a decade off. Jill DeWit: All right, anyway so look. Jack Butala: What were you like when you were 16? Jill DeWit: That’s a better question. Thank you, oh I knew it all. Jack Butala: Oh really, it was that bad? Jill DeWit: Oh, I didn’t know, it wasn’t that bad, but I was very independent, and very comfortable in my… first concert, I drove myself to see, here I go, now we’re all gonna know how old I am, when I was 16 years old I was so darn excited, I was go drive up to LA and see Billy Idol. Jill DeWit: And that was the first time I got to drive myself to a concert, and all that was really cool. Jack Butala: It always comes to live music with you. Jack Butala: Everything circles around live music. Jill DeWit: It does, isn’t that funny? That’s interesting, and kid number one, that’s the same for her. Jack Butala: Back to real estate. Jack Butala: I caused a problem, sure the 1983 thing. Jack Butala: To answer your question Tom, there aren’t special documents at all. What kind of documents are needed to close an executor property? There’s no special documents, it’s a deed like everything else. You just have to line up the right, make sure the chain of title makes sense, that there’s no breaks in the chain, and it can be daunting the first couple of times around, but again, that’s what Land Academy’s for. So if you’re not getting the answers that you need on SuccessPlant or on LandInvestors somewhere, reach out to us and we’ll help you with it. 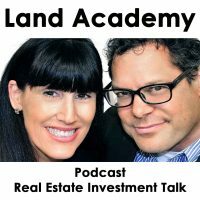 If you have a question or you want to be in the show, reach out to either one of us, like I said, on LandInvestors.com. How do you buy an apartment building, Jill? Jill DeWit: Send the owner an offer. Jack Butala: Hah, nailed it. Jill DeWit: Is there another way? Jack Butala: Yeah, you could go, here’s a wrong way. Jill DeWit: I could go door to door, go drive around. Jack Butala: Here’s the wrong way to buy an apartment building; go on to LoopNet.com and pick one out and buy it. No, no. That’s not the right way to do it. Is that how you buy a house? You go onto the MLS and pick one out and buy it? No. You buy an apartment building the same way you buy a piece of land. The same way that you buy any other type of real estate; you send a bunch of offers out for a lower price than you think it’s worth. But Jack, I don’t have any money. How do I buy an apartment building? It turns out that in that very same database are guys that own apartment buildings, and some of them are real good at it. Way better than you if you’re new. Way better than me, I’ll tell you that. I’m the worst apartment building owner there ever was, which is why I don’t own any anymore. Find those guys and tell them you have a smokin’ deal on an apartment building and you have no idea what you’re doing. But, you’d like to partner with them. More than half of them will drop what they’re doing and try to do this deal if it’s good. Jill DeWit: Do you remember when we went to that, was it last fall sometime, I drug you to that, one of the first meet ups I got you to go to, and this was the topic? And they had a panel of four guys that all do apartment buildings just a little bit different, and I remember it was a good sized group. I want to say, 75 people or so? Jack Butala: It was a great meetup. Jack Butala: At Manhattan Beach. Jill DeWit: Yeah, it was a good bring you to, cuz I had knew a little bit of meet ups and then we got so much out of that, just what the world was about and who goes and all that good stuff. Anyway, at least in our niche. But what I thought was so interesting, cuz I remember the whole, you and I knew this, but the whole audience was so taken by surprise when these guys all conferred that, yeah, there’s still some mom and pops out there, husband and wives, that own apartment buildings, that they’re paid for and they’ve had them forever. People went, what? I mean they had no idea that it was like that, they think that everybody that owns an apartment building is a big corporation and it’s gonna be a big process, and you’d have to go through all this stuff, and they also said, no there’s people out there that own them. There’s that one you and I looked at, remember on the Strand? It was literally on the Strand, in Manhattan Beach which is there’s a front house, and the back house is an apartment building. Jill DeWit: It’s the same elderly couple, they’re just done with it now, and it’s not cheap, of course, but you know they own it outright, and that’s it. Jack Butala: In the 40’s, 50’s, and 60’s, and 70’s it was very common in Southern California for people to buy a piece of land, and cut it in half, build their dream house on one end and build a tiny four unit apartment building, or even one or two units in a separate property, to pay for the other one. Jack Butala: And those are all still around. Jill and I live in one of those right now there and it’s a great thing to have income coming in from another building and that pays, almost entirely, pays for the property. Jill DeWit: We don’t do that with the income. Jill DeWit: We just spread out. Jack Butala: We occupy all the buildings ourselves, personally. Jill DeWit: Yes, you do. Jack Butala: It’s a campus, that’s what I call it. Jill DeWit: Exactly, love it. Jack Butala: So, how do you buy an apartment building? Here’s are the steps; you go and get a data set, like Real Quest, in fact I would highly recommend Real Quest Pro, which Jill and I, full disclosure, are licensed providers of, you send everybody an offer, in the data set, let’s say you want to do it in Arizona, let’s say Maricopa County. You make sure you price the offer on a per square foot basis, or a per unit basis, you don’t want to price it, the way you price land is very different, so you don’t want to apply those concepts. Then through your dealing, you’re gonna get one or two people calling you back saying, I would love to sell you my building for this amount, but first you should know this, and then that is going to trigger you to do two things; write a letter to the very same people and say, I’ve got this great apartment building and I don’t know what I’m doing and I’d love to partner with you, apartment building deal. Second thing is put a posting in Facebook that says I’ve a fantastic acquisition on an apartment building and if you own a building, I seriously need your help as a partner. If you’re patient, and you talk to these guys on the phone with a little bit of respect, you will rapidly acquire apartment buildings this way. Well Jack, if it’s so easy why don’t you don’t it? Here’s why; I don’t like apartment buildings. I don’t like renters. Jack Butala: I don’t like putting new roofs on stuff. I like land. That’s why. But, I got this question from a member last week, on a data radio call, cuz they’re applying all these concepts, Jill, from Land Academy, for doing apartment acquisitions and it’s working out great for the guy. Jill DeWit: Exactly. That’s a perfect take away there too, I tell people all the time; what you and I, we call it land and what you and I teach and talk about and everything is land, but does this apply to every single property type? Heck yeah. Jack Butala: It does. It applies to everything, this is the way we’re buying a boat, right now. Join us in another episode, where Jack and Jill discuss how to use information, that’s me. Jill DeWit: And it’s price, and that’s me. Jill DeWit: Who was it who was asking about this? Is this a brand new person, or is it someone down the road now and thinking of different projects? Jack Butala: I don’t remember his name, but he was of the members that you and I, he’s been around for a while. He was having babies at the time that he started this and now he’s not. Remember he’s incredibly successful, top five producers in the whole group. Well this kid that just called reminded me of him, he’s in the exact same stage, he’s got kids in background, and his wife got on the phone and, thank you, thank you, thank you. Nicest kids in the world. They’re gonna kill it. So, he’s like, eventually I want apartment buildings but I know land will get me there. I said, you’re a lot closer than you think, man. This is how you do it. And he’s just like, thank you. It was a good call. Jill DeWit: That’s cool. Isn’t that funny? Some people just have a thing that they want to do, for whatever reason, they need to check it off their list. Say I own an apartment building, they may not want to keep it, when they get in, but they want to do that, and that’s cool. Jack Butala: Does your list of stuff that you want to do get bigger or smaller as you get older? Jill DeWit: Mm-hmm (affirmative), it really does. I go, yeah I don’t need that anymore. Jack Butala: Yeah, me too Jill. Jill DeWit: I don’t want that anymore. I think too, what’s funny too, part of it is, there’s a financial thing and I don’t know what it is in our heads but when you can’t afford something, you want everything. Isn’t it true? You can’t afford that car, or you can’t afford that whatever, you think, oh if I could only have that, and then you get to a point where you’re like, you know I can afford all that but now I don’t really want it. It’s really funny, you make different decisions. I think you make better decisions. Jack Butala: Oh yeah. Less stuff is way better, I think. Jill DeWit: Mm-hmm (affirmative), definitely. Jack Butala: I haven’t always thought that way. Information and inspiration to buy undervalued property.